my compliments to the weldor. thanks guys. getting close. i have a bet with my brother to finish it by july 1st. cant loose! The Z1 never came with a rear disk. 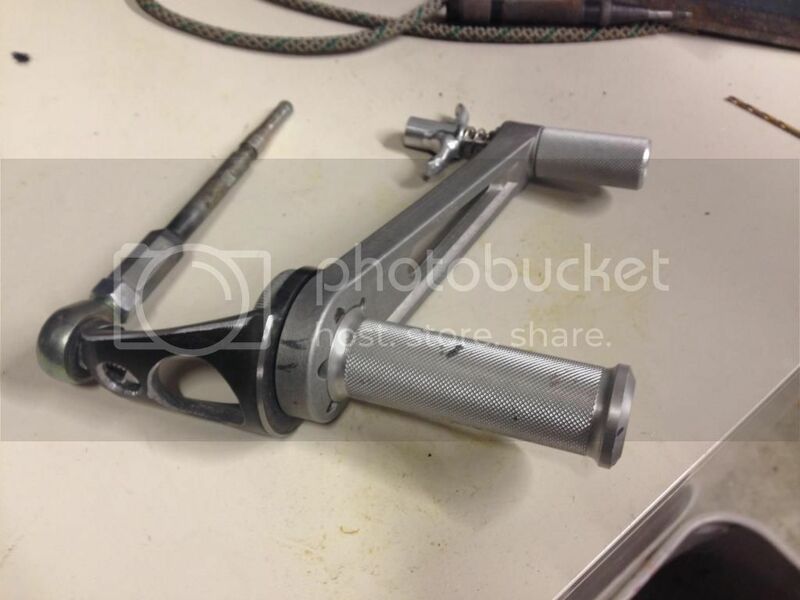 If you had this caliper, the entire rear end would have to be swapped, and a bracket for the MC / pushrod pivot made. No offense intended, but I wonder if you had the correct components set up properly, mint or not. I hardly ever use my rear brake, except in emergency braking situations, or on dirt/grass/gravel. In any of those scenarios you do not want an aggressive rear brake or the rear will lock up. I'm sure this setup will have plenty of brake force. Sorry kz1000 and from a distance it looks to be the same. A back break is useful. People down play needing an effective rear brake. 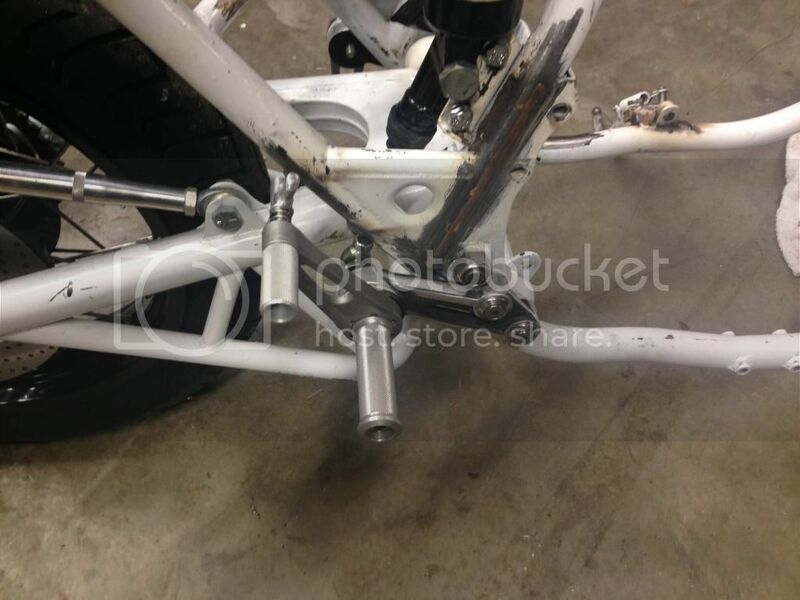 I just think with all the effort in the build, keeping the stock rear brake short changes the build. Yes it is very heavy indeed and another vote for its terrible performance. Derp. should have guessed you were talking about your KZ1000A1. you had/have this caliper. Like I said, i will probably change it down the road, but this is more than adequate for the moment. I also want to ride this bike, messing with something that works fine at this point is a great way to get derailed. i don't want to loose the bet! Just a quick update. I was over at my buddies place using his sheet brake, its a cheapo but gets good results for small stuff. I made a couple of small aluminum brackets to hold various electrical components. 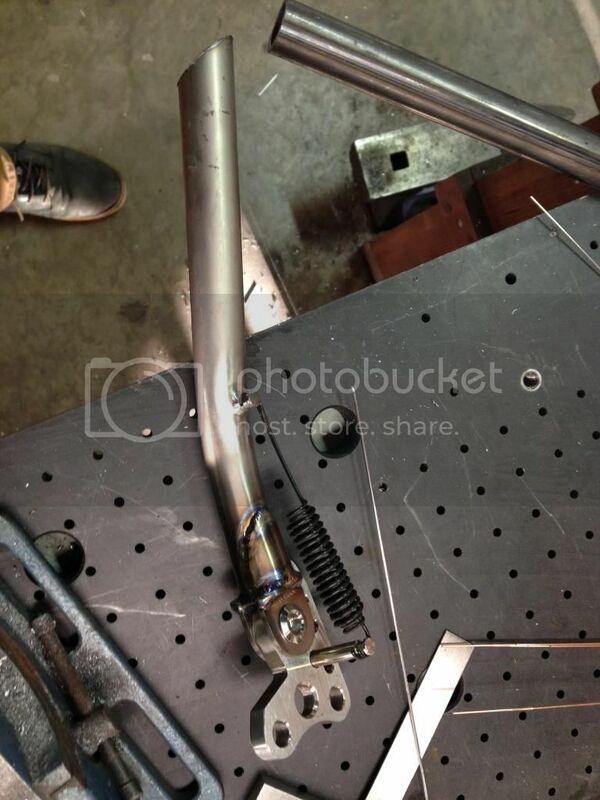 I also thought i'd share a pic of a titanium kickstand he has been fiddling with for weeks. 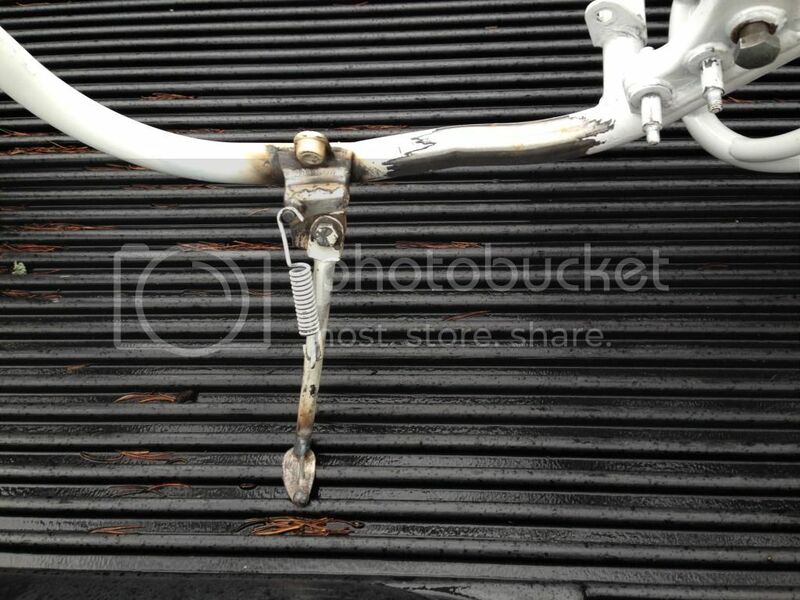 Think its for an Aprilla race bike. 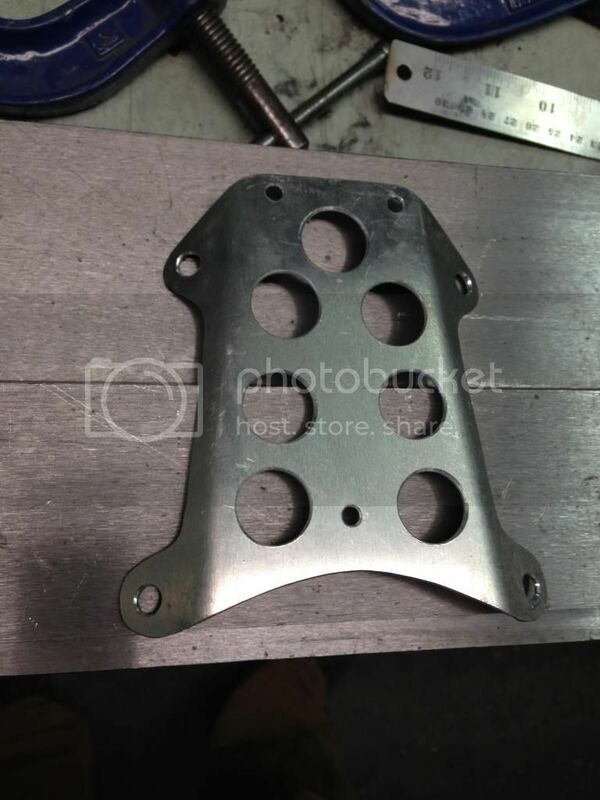 Looks like a nice skid plate! 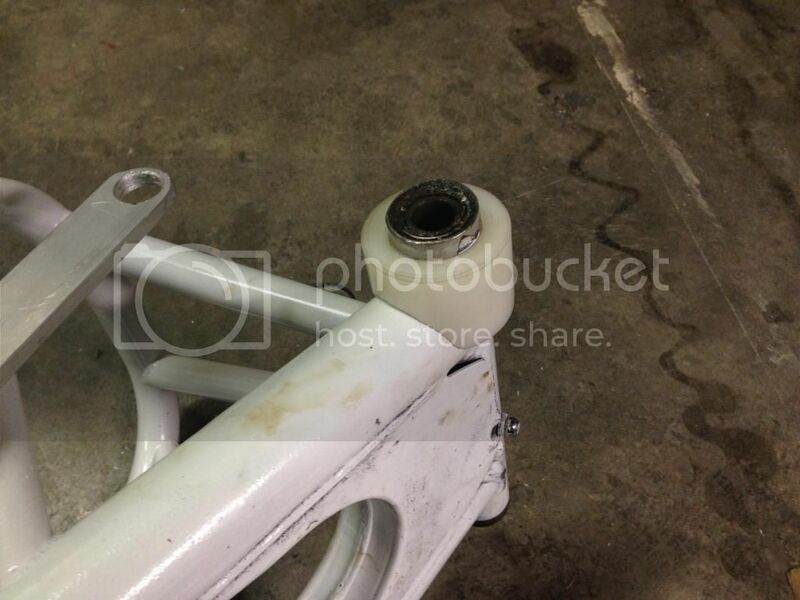 Ya I will need a modified kickstand on my Kz too. She sits pretty low compared to stock. My late birthday present came 1.75" over stock to even out the geometry and gain ride height. They are much nicer than the Works shocks I previously was planning on using. 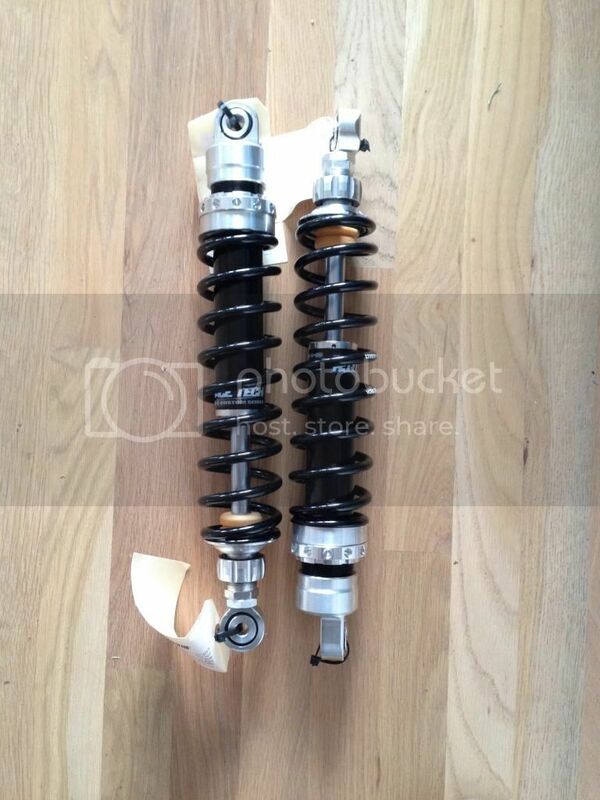 They are beefier everywhere and 6oz lighter per shock. 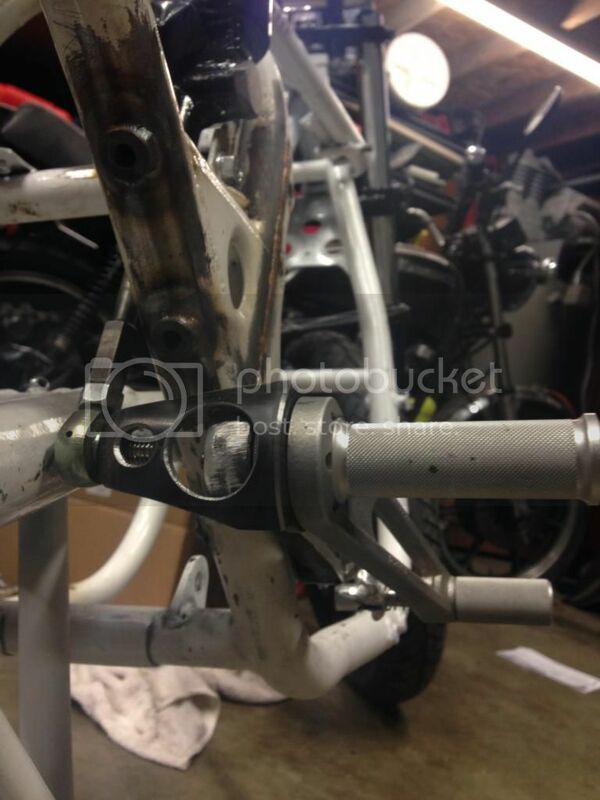 Because of the over length shocks I need a chain slider on the swingarm. Eric turned up this chunk of derelin and I fish-mouthed it so It uses no fasteners, as it is entrapped when the swingarm is mounted. I may need more sliders, but that can be addressed later if need be. 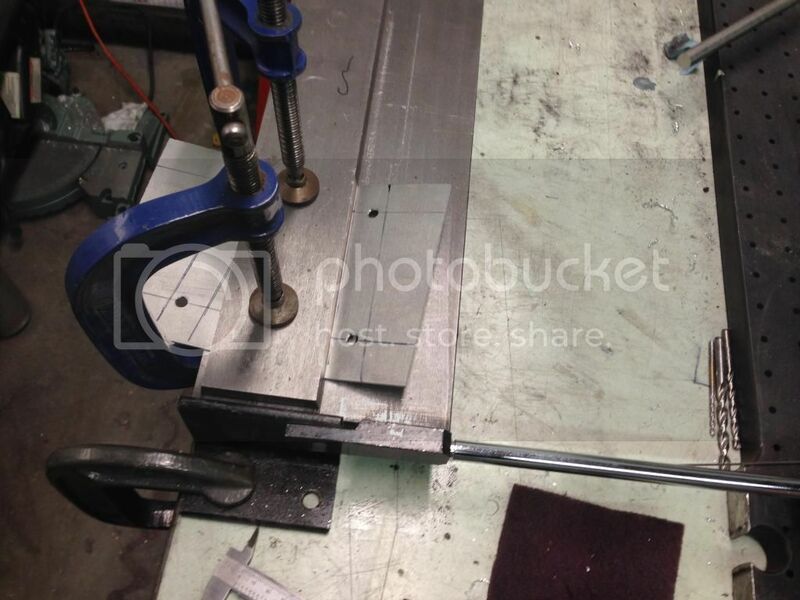 All the remaining tabs needed are welded on. 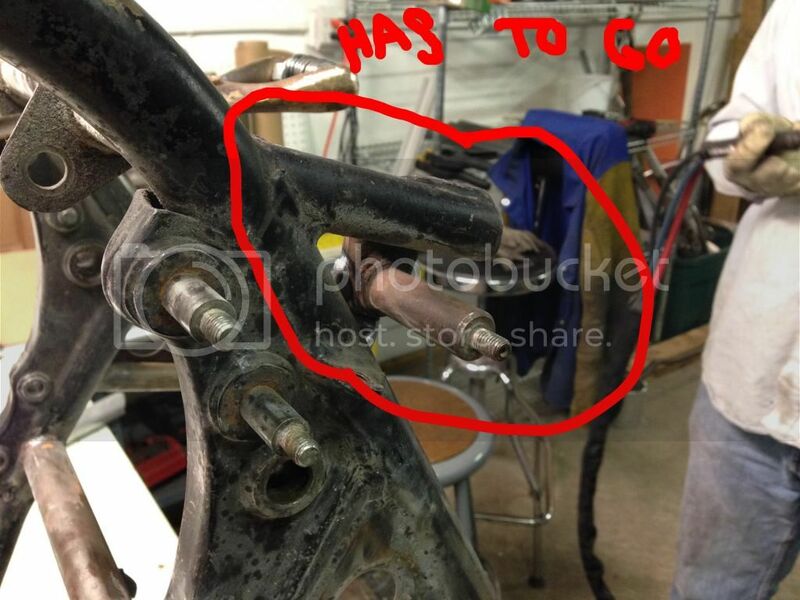 The bungs for the exhaust hanger are welded in. A couple nasty welds have been cleaned up. The kickstand has been moved up to the bottom engine mount, the detent spring peg had to be relocated so the engine bolt could fit. The kickstand was shorted because it is now farther out from the center. I have plans for something trick to replace the stock solid one. I then turned my attention to the rear sets. These Tarrozis were meant to be bolt-ons so they had to compromise a bit, like using the huge stock brake pivot. I also wanted to retain the use of my kickstart and the brake pedal was solidly blocking it. 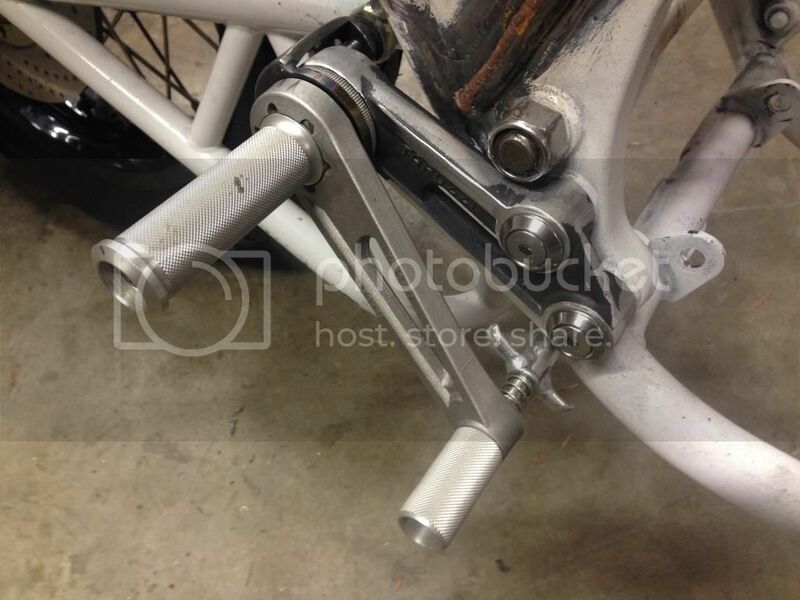 I saw on a XS650 forum where people had cut a channel in the pivot to allow the pedal to be brought back out of the way temporarily. To do this you had to leave everything a bit loose to allow the pedal and pivot not to bind. I didn't want any slop in my footpegs so Eric and I came up with a solution i am very proud of. 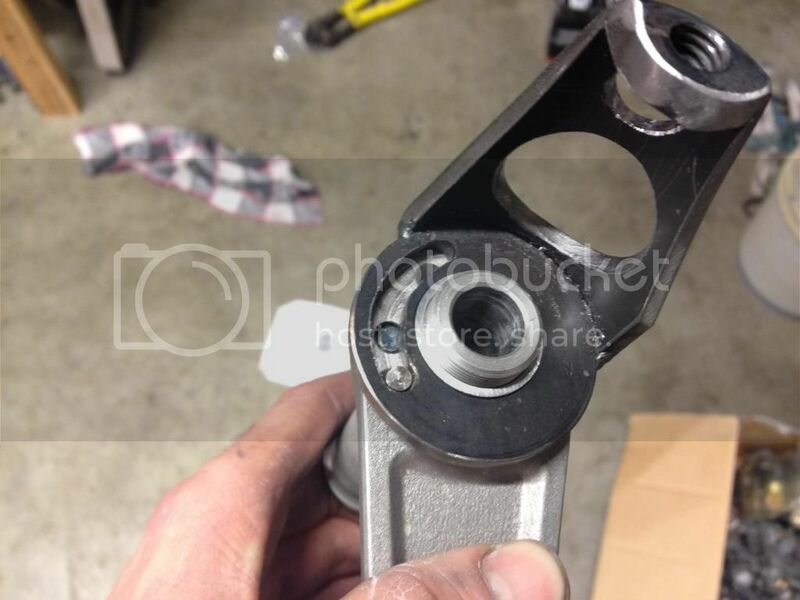 I cut a piece of 1"tube with .065" wall thickness and it made a perfect bushing for the footpeg and pivot. As a safety feature a spring loaded pin was added on the pedal so that the brake lever cannot be accidentally kicked up when riding. You simply compress the spring and pull the pedal up. 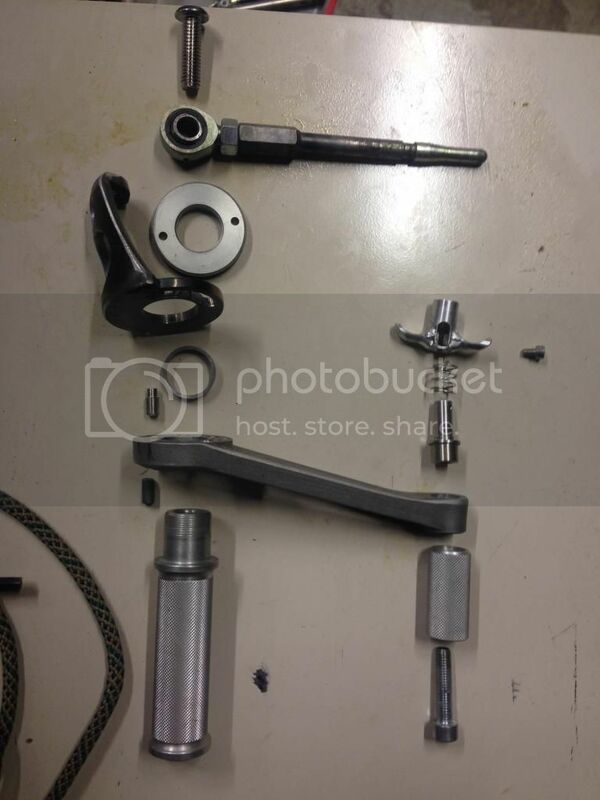 Eric turned most of the parts, while grumbling about his "clapped out" lathe, and did the amazing welding as usual. I'm nearly done finishing the parts, I just need to clean up some if the holes I drilled. 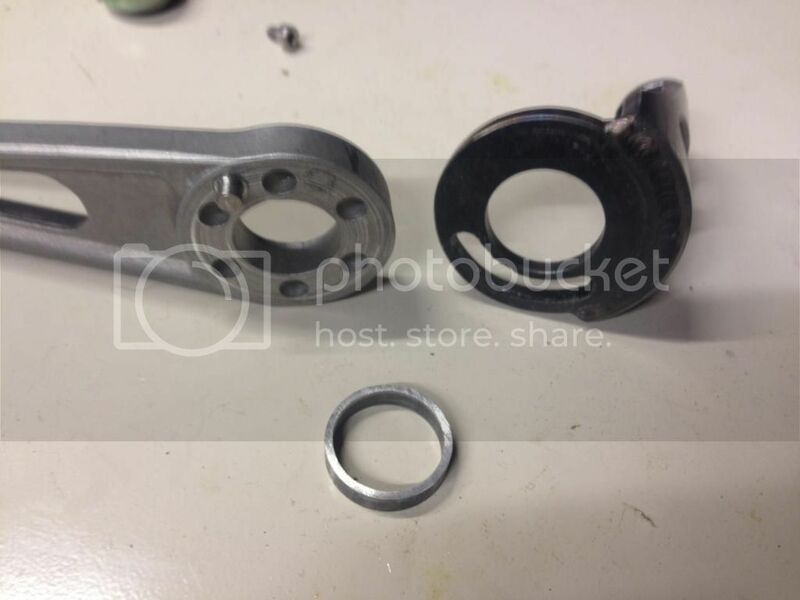 I also cut the threads off the footpeg mounting studs and drilled and tapped them to use some stainless countersunk washers. I also had to file down the Tarrozi bracket mounts to remove the counter sunk flange on the casting. 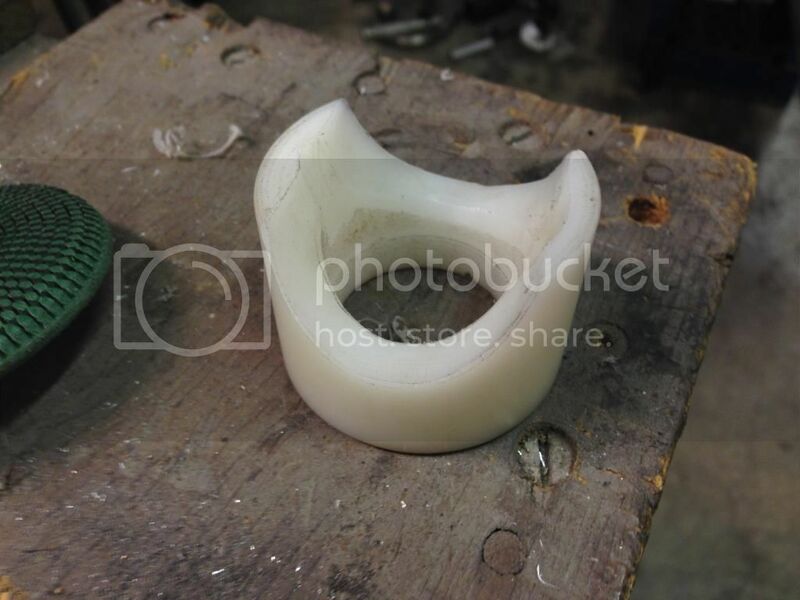 I also took the opportunity to remove the casting marks. 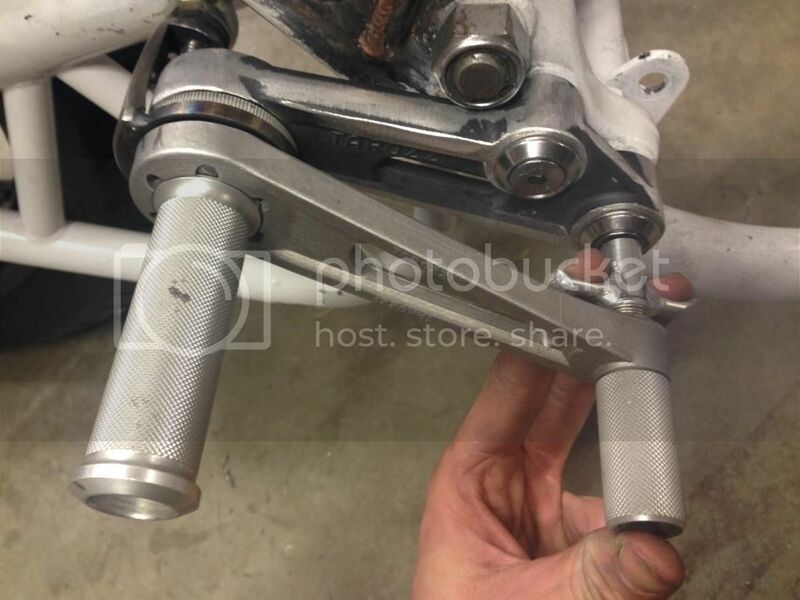 I have ordered folding footpegs from Fast from the Past, so I should have plenty of clearance for the kicker.